Templates can help speed up your analysis, as once they are created, you can easily apply them as you work on any chart. This page shows a list of the templates you've created in your Barchart account. A template is used to display a chart with pre-defined settings. You can use a template by applying it to a chart when on a symbol's chart page, or on a Flipchart. 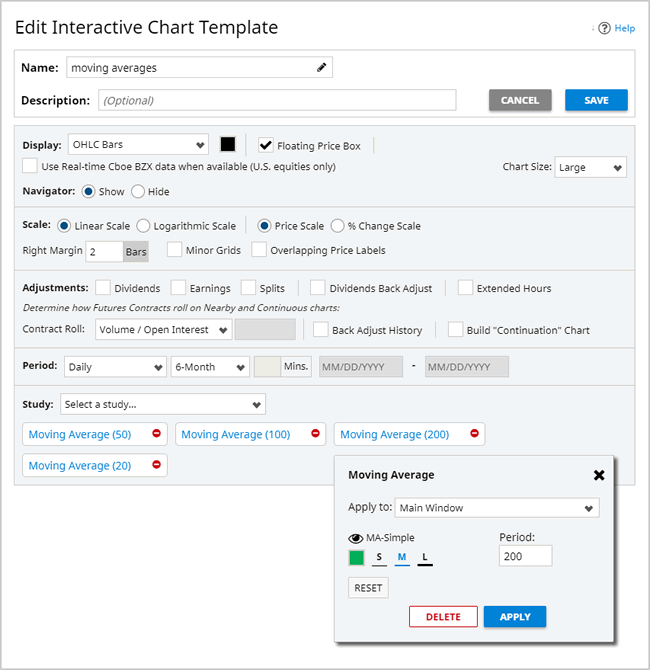 A free site membership allows you to create up to 5 total (Technical + Interactive) Chart Templates, while Barchart Premier Members may create unlimited Chart Templates. Use this page to add, edit, delete or reorder your custom templates. Enter a new name using the text box at the top of the page and click CREATE. Click on the red icon to the left of the Chart Template Name. You will be asked to confirm your request to delete. Click on the Chart Template Name. You will be brought to the Edit Template page. Clicking this button will take you to your Site Preferences page, where you can identify a default Chart and Flipcharts Template to use when logged into the site.